We are all connected to the ocean, and organisms living in the ocean are an integral – if often unseen – part of our lives. You might be more connected to the ocean than you think. For example, fertilizer used to grow vegetables is often made from fish, and ingredients derived from fish are often added to processed foods. And amazingly, the ocean produces more than half of the oxygen on the planet, while also being responsible for storing 50 times more carbon dioxide than is found in the atmosphere. The impact of human activity can be observed in a variety of ways. Run-off from agriculture empties into fragile marine ecosystems, and plastic accumulates in the ocean and cycles back into our food supply, for example. Consequences of human activity disturb a precarious balance that is not fully understood. Within the American mind, there is a fractured connection to the ocean, and it is this disconnect that Samm Newton is studying. As a 3rd year Master’s student in the Environmental Arts and Humanities program in the College of Liberal Arts, she is exploring multiple questions as part of her thesis. 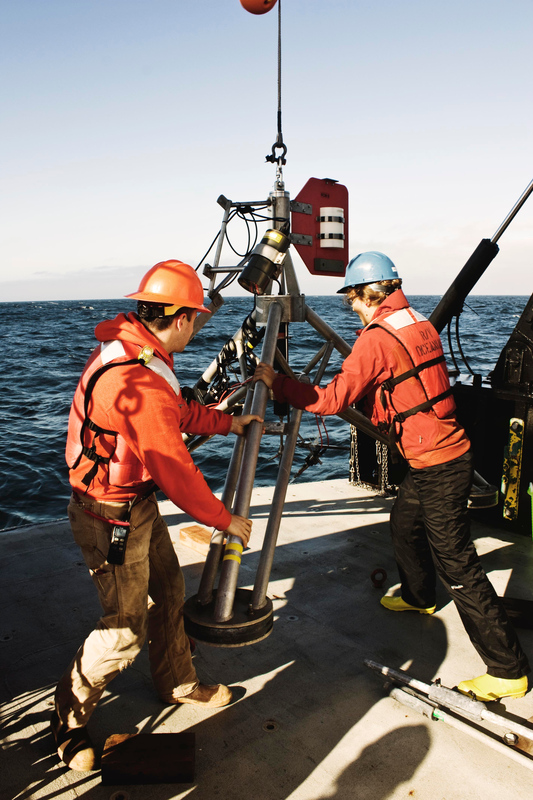 What has been the role of science and technology in how we have known the ocean? What has been the relationship between that knowledge and how we have valued and made decisions about marine systems? And, how can scholars approach the study of these relationships in new ways? 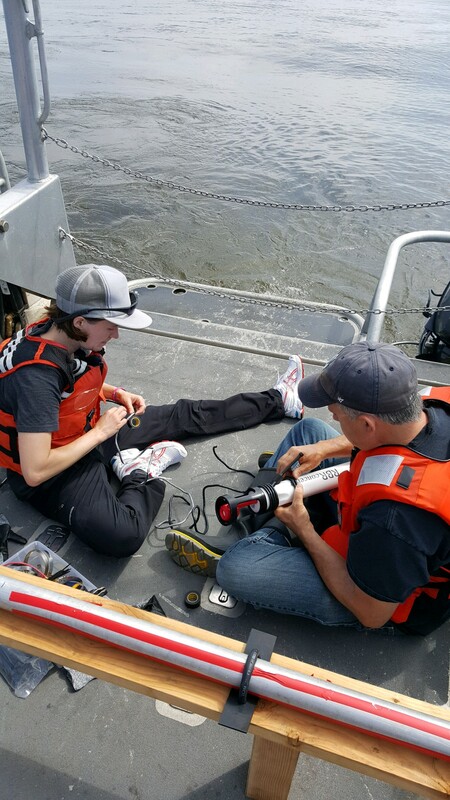 Samm studies the ocean using methods traditionally associated with the humanities. She describes her method as an interdisciplinary approach to unpack how we have generated knowledge about the ocean through science. Her approach includes extracting information from scientific history and papers, archives, oral histories, as well as popular literature from sources like National Geographic and the Washington Post. How can we encourage people to recognize their connection to the ocean, and direct their attention to how their lives are impacted by ocean issues? Samm indicates how advancements in technology and media have created new ways for people to access scientific knowledge about the ocean. With outlets such as Nautilus live, people can learn about ocean ecosystems by watching videos of organisms living in the sea. They can also interact with scientists in real time (check out this one about a large number of octopus brooding near Monterey Bay, CA. Science videos on the internet have become an engaging and popular way to share knowledge of the ocean and science with a broad audience. Samm grew up in the “shadow of the petrochemical industry” in Freeport, Texas, where the sea is brown, and air and water pollution are an everyday reality. Observing these anthropogenic forces impacting her coast and community, and how disconnected people seem to be from the ocean, led her to question the relationship between humans and marine environments. 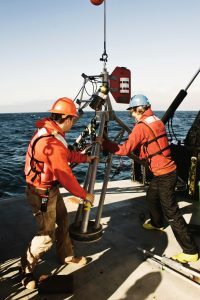 She found that science and technology have played a dominant role in how we have known the ocean—and possibly how we have valued it. Samm also found that methods from the humanities, particularly marine environmental history, as well as science and technology studies, provide a meaningful framework to examine that relationship further. During her undergrad, Samm studied psychology and behavioral neuroendocrinology, with a focus toward consciousness and philosophy of the mind. She spent 10 years working outside of academia before pursuing a Master’s degree at OSU. 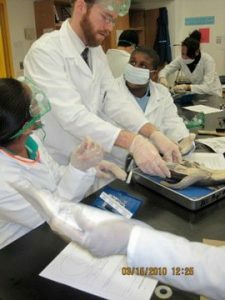 Samm credits the Environmental Arts and Humanities program at OSU with providing a flexible framework for people from different backgrounds – including art and science – to decide how they want to study a topic of interest. After finishing her Master’s degree, Samm plans to pursue a PhD in an interdisciplinary field studying environmental issues. 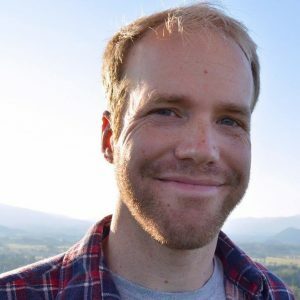 As a graduate student at OSU, Samm has enjoyed working in a “scholarly space, and getting the opportunity to do research.” Beyond grad school, Samm’s goal is to be involved in work that transforms the world, and to contribute to projects that strengthen interdisciplinary associations between diverse, yet interconnected, academic fields. Samm will also be the Featured Artist at Hatfield Marine Science Center in Newport, OR in January 2019. Check out this page for more details! This entry was posted in College of Earth Oceanic and Atmospheric Sciences, College of Liberal Arts, Enivronmental Sciences, Environmental and Molecular Toxicology, Environmental Arts & Humanities, Fisheries and Wildlife, graduate school, History of Science, Master in Fine Arts, ocean, Ocean Ecology and Biogeochemistry, Physical Oceanography, science communication, STEM Outreach, Water Resources Management, Water Resources Policy and Management on 2018-11-06 by Lillian Padgitt-Cobb. Oceans cover more than 70% of the Earth’s surface and some studies suggest we still have over 91% of marine species that await discovery. Even as far back as 2010 some NASA scientists admit we knew more about the surface of Mars than we did about the bottom of our own oceans! Despite the fact we may not know everything about our oceans just yet, one thing is certain: plastics are becoming part of ecosystems that have never experienced it and we’re beginning to understand its massive impact. One estimate suggests that even if you had 100 ships towing for 10 hours a day, with 200 meters of netting and perfectly capturing every large and tiny piece of plastic, we could only clean up 2% of the Great Pacific Garbage Patch every year. It would take 50 years to clean everything up, assuming we magically stopped using plastics on Earth. As one Nature research article suggests, the problems lies mostly with local municipalities; but that means with targeted local action, individuals can make a real difference and limit how much plastic makes it to our oceans. So you may be thinking “let’s tell all our friends these plastic facts and then everyone will stop using plastic, right?”. Not so fast, unfortunately a host of studies show just informing people about the scope of the problem doesn’t always make them change their behavior to ameliorate the problem in question. Our guest this evening is Katy Nalven, a 2nd year Masters student in the Marine Resources Management program, who is using a community based social marketing approach to ask people not only IF they know about the problem of plastics in oceans, but she also seeks to understand how people think about this problem and what could be individual hurdles to decreasing plastic usage. Using a survey based approach administered at the Oregon Coast Aquarium, Katy plans to examine a few specific communities of interest to identify how the views around plastic usage from Aquarium visitors and local community members may differ and hopefully where they overlap. This community based social marketing approach has many steps, but it’s proven more effective in changing behaviors for beneficial outcomes rather than just mass media information campaigns by themselves. By identifying a target goal for a community of interest you can tailor educational material that will have the greatest chance of success. For example, if your goal is to decrease plastic usage for coastal communities in Oregon, you may find that a common behavior in the community you can target to have the greatest impact such as bringing your own mug to coffee shops for a discount, or automatically saying “no straw please” whenever going out to eat. Katy is beginning to pin down how these Oregon coast communities view plastic usage with the hope that a future student can begin implementing her recommended marketing strategies to change behaviors for a more positive ocean health outlook. Katy grew up in the landlocked state of Arizona constantly curious about animals, but on a childhood visit to SeaWorld San Diego she became exposed to the wonders of the ocean and was wonderstruck by a close call with a walrus. Near the end of a Biology degree in her undergraduate years, simultaneously competing as an NAIA Soccer player for Lyons College, Katy was looking for career options and with a glimpse of her stuffed walrus she got at the San Diego Zoo, she decided to look at Alaska for jobs. After a few summers being a whale watching guide in Juneau, an animal handling internship in Florida, and then another internship in Hawaii Katy decided she wanted to formally revisit her science roots but with a public policy perspective. 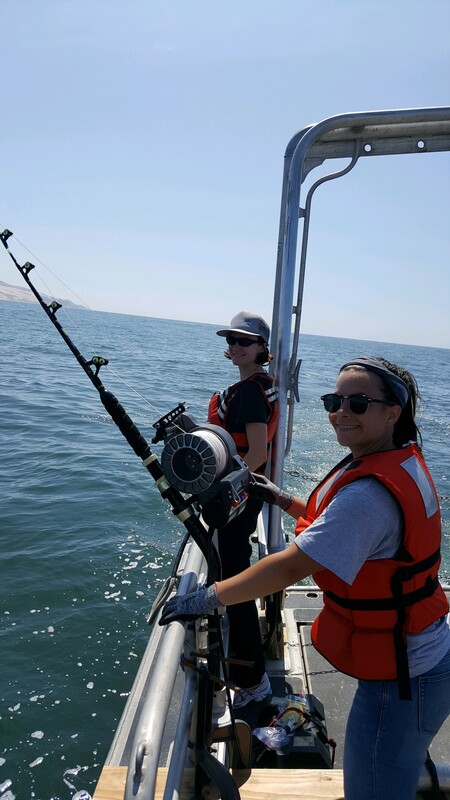 Oregon State University’s Marine Resource Management Program was the perfect fit. In fact, once she was able to connect with her advisor, Dr. Kerry Carlin-Morgan who is also the Education Director for the Oregon Coast Aquarium, Katy knew this was the perfect step for her career. 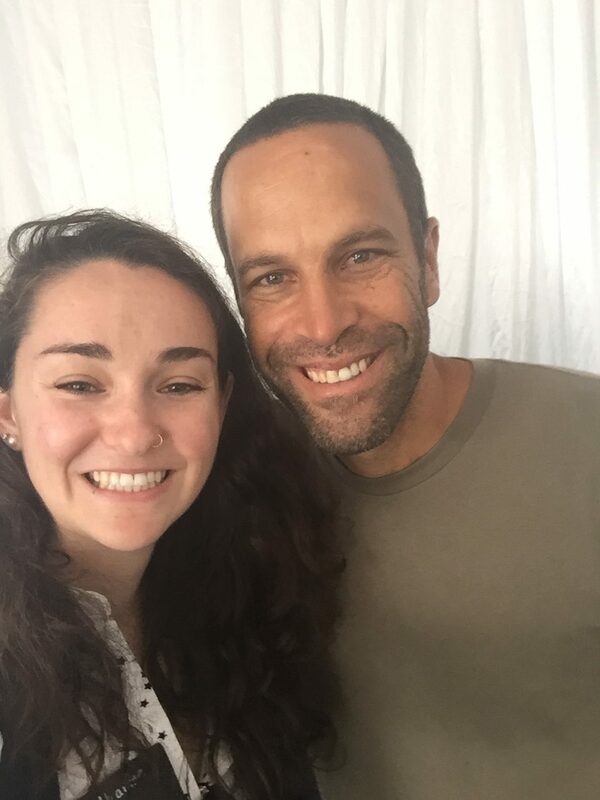 Be sure to tune in to Katy’s interview Sunday August 19th at 7PM on 88.7FM, or listen live, to learn more about her findings about how we view plastic pollution, and how we can potentially make local changes to help the global ecosystem. 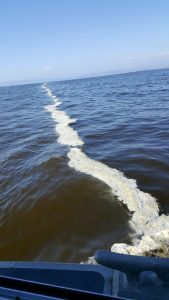 This entry was posted in College of Earth Oceanic and Atmospheric Sciences, Education, ocean, Public Policy and tagged aquarium, community, ocean, plastic on 2018-08-18 by Adrian Gallo. Oak Creek near McDonald Dunn research lab. The salamander and trout in the experiments were collected along this stretch of creek. As a first year Master’s student in the lab of Ivan Arismendi, Francisco Pickens studies how the changing, warming climate impacts animals inhabiting stream ecosystems. A major component of stream ecosystem health is rainfall. In examining and predicting the effects of climate change on rainfall, it is important to consider not only the amount of rainfall, but also the timing of rainfall. Although a stream may receive a consistent amount of rain, the duration of the rainy season is projected to shrink, leading to higher flows earlier in the year and a shift in the timing of the lowest water depth. Currently, low flow and peak summer temperature are separated by time. With the shortening and early arrival of the rainy season, it is more likely that low flow and peak summer temperature will coincide. A curious trout in one of the experimental tanks. Francisco is trying to determine how the convergence of these two events will impact the animals inhabiting streams. This is an important question because the animals found in streams are ectothermic, meaning that they rely on their surrounding environment to regulate their body temperature. Synchronization of the peak summer temperature with the lowest level of water flow could raise the temperature of the water, profoundly impacting the physiology of the animals living in these streams. How to study animals in stream ecosystems? Salamander in its terrestrial stage. Using a simulated stream environment in a controlled lab setting, Francisco studies how temperature and low water depth impact the physiology and behavior of two abundant stream species – cutthroat trout and the pacific giant salamander. Francisco controls the water temperature and depth, with depth serving as a proxy for stream water level. Blood glucose level serves as the experimental readout for assessing physiological stress because elevated blood glucose is an indicator of stress. 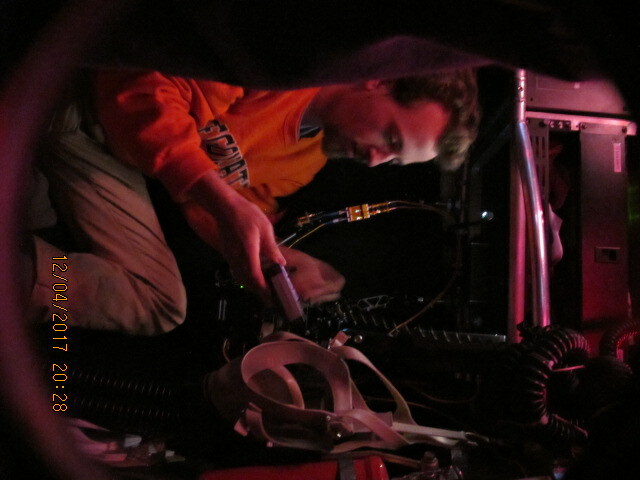 Francisco also studies the animals’ behavior in response to changing conditions. Increased speed, distance traveled, and aggressiveness are all indicators of stress. Francisco analyzes their behavior by tracking their movement through video. Manual frame-by-frame video analysis is time consuming for a single researcher, but lends itself well to automation by computer. Francisco is in the process of implementing a computer vision-based tool to track the animals’ movement automatically. The crew that assisted in helping collect the animals: From left to right: Chris Flora (undergraduate), Lauren Zatkos (Master’s student), Ivan Arismendi (PI). Originally from a small town in Washington state, Francisco grew up in a logging community near the woods. He knew he wanted to pursue a career involving wild animals and fishing, with the opportunity to work outside. Francisco came to OSU’s Department of Fisheries and Wildlife for his undergraduate studies. As an undergrad, Francisco had the opportunity to explore research through the NSF REU program while working on a project related to algae in the lab of Brooke Penaluna. After he finishes his Master’s degree at OSU, Francisco would like to continue working as a data scientist in a federal or state agency. Tune in on Sunday, June 24th at 7pm PST on KBVR Corvallis 88.7 FM, or listen live at kbvr.com/listen. Also, check us out on Apple Podcasts! This entry was posted in Bioresource Research, College of Agricultural Sciences, College of Forestry, Crop and Soil Science, Ecology, Enivronmental Sciences, Fisheries and Wildlife, Forest Engineering, Resources, and Management, Forestry, graduate school, Integrative Biology, Marine Resource Management, Ocean Ecology and Biogeochemistry, science communication, STEM Outreach, Water Resources Management, Water Resources Policy and Management on 2018-06-24 by Lillian Padgitt-Cobb. One of the many consequences associated with climate change is ocean acidification. This process occurs when high atmospheric carbon dioxide dissolves into the ocean lowering ocean pH. Concern about ocean acidification has increased recently with the majority of scientific publications about ocean acidification being released in the last 5 years. Despite this uptick in attention, much is still unknown about the effects of ocean acidification on marine organisms. 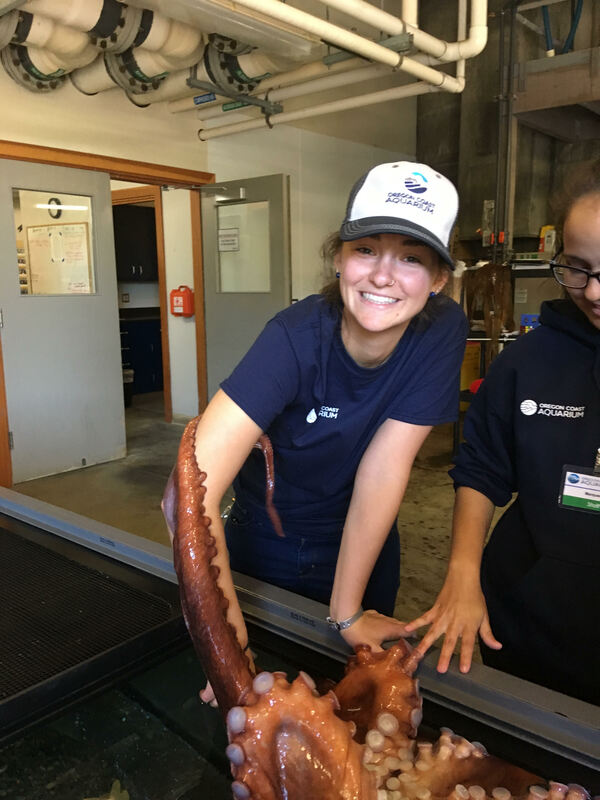 Our guest this week, Hannah Gossner, a second year Master’s student in the Marine Resource Management Program, is investigating the physiological effects of ocean acidification on Dungeness crab (Metacarcinus magister) with the help of advisor Francis Chan. Most folks in Oregon recognize the Dungeness crab as a critter than ends up on their plate. Dungeness crab harvest is a multimillion dollar industry because of its culinary use, but Dungeness crab also play an important role in the ocean ecosystem. Due to their prevalence and life cycle, they are important both as scavengers and as a food source to other animals. To study the effect of ocean acidification on Dungeness crab, Hannah simulates a variety of ocean conditions in sealed chamber where she can control oxygen and carbon dioxide levels. Then by measuring the respiration of an individual crab she can better understand the organism’s stress response to a range of oxygen and carbon dioxide ratios. Hannah hopes that her work will provide a template for measuring the tolerance of other animals to changes in ocean chemistry. She is also interested in the interplay between science, management, and policy, and plans to share her results with local managers and decision makers. 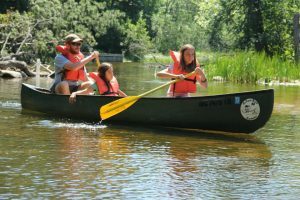 Growing up in Connecticut, Hannah spent a lot of time on the water in her dad’s boat, and developed an interest in marine science. Hannah majored in Marine Science at Boston University where she participated in a research project which used stable isotope analysis to monitor changes in food webs involving ctenophores and forage fish. Hannah also did a SEA Semester (not to be confused with a Semester at Sea) where she worked on a boat and studied sustainability in Polynesian island cultures and ecosystems. Hannah knew early on that she wanted to go to graduate school, and after a brief adventure monitoring coral reefs off the coast of Africa, she secured her current position at Oregon State. Tune in Sunday June, 17 at 7 pm PST to learn more about Hannah’s research and journey to graduate school. Not a local listener? Stream the show live or catch the episode on our podcast. Hannah enjoying her favorite past time, diving! This entry was posted in and Atmospheric Sciences, Marine Resource Management and tagged climate change, crab, ctenophores, Ecology, fish, marine ecosystems, marine science, ocean acidification, podcast, research, sea semester, simulations on 2018-06-15 by Kristen Finch. Theresa on a recent cruise on the Oceanus. Foram shells are particularly useful for scientists because they preserve well and are found ubiquitously in ocean sediment, offering a consistent glimpse into the dynamic state of ocean chemistry. While living, forams float in or near the surface of the sea, and after they die, they sink to the bottom of the sea floor. The accumulating foram shells serve as an archive of how ocean conditions have changed, like how tree rings reflect the environmental conditions of the past. Obtaining these records requires drilling cores (up to 1000 m!) into deep sea sediments, work that is carried out by an international consortium of scientists aboard large ocean research vessels. These cores span a time frame of 800 million years, which is the oldest continuous record of ocean chemistry. Each slice of the core represents a snapshot of time, with each centimeter spanning 1,000 years of sediment accumulation. 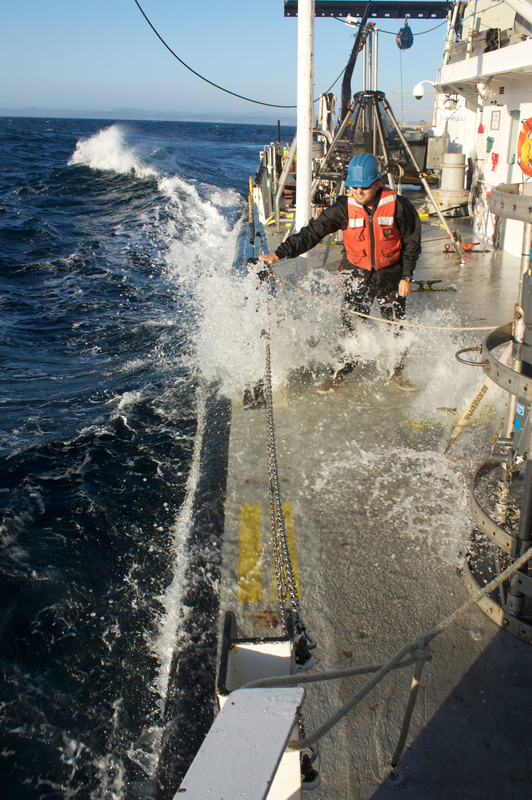 Theresa is using cores that reach a depth of a few meters below the surface of the ocean floor. These cores were drilled in the 1980s by a now-retired OSU ship and are housed at OSU. Theresa on a recent cruise on the Oceanus, deploying a net to collect live forams. Photo credit: Natasha Christman. The process of core analysis involves sampling a slice of the core, then washing the sediment (kind of like a pour over coffee) and looking at the remainder of larger-sized sediment under a powerful microscope to select foram species. The selected shells undergo elemental analysis using mass spectrometry. Vastly diverse shell shapes and patterns result in different elements and chemistries being incorporated into the shells. Coupled to the mass spectrometer is a laser that ablates through the foram shell, providing a more detailed view of the layers within the shell. This provides a snapshot of ocean conditions for the 4 weeks-or-so that the foram was alive. It also indicates how the foram responded to light changes from day to night. Theresa is early in her PhD program, and in the next few years plans to do field work on the Oregon coast and on Catalina island off the coast of California. She also plans to undertake culturing experiments to further study the composition of the tiny foram specimens. Why grad school at OSU? Theresa completed her undergraduate degree at Queen’s University in Ontario, followed by completion of a Master’s degree at San Francisco State University. She was interested in pursuing paleo and climate studies after transformative classes in her undergrad. In between her undergraduate and Master’s studies she spent a year working at Mt. Evans in Colorado as part of the National Park Service and Student Conservation Association. Theresa had already met her advisor, Dr. Jennifer Fehrenbacher, while completing her Master’s degree at SF State. Theresa knew she was interested in attending OSU for grad school for several reasons: to work with her advisor, and to have access to the core repository, research ships, and technical equipment available at OSU. To hear more about Theresa’s research and her experience as a PhD student at OSU, tune in on Sunday, June 10th at 7pm on KBVR Corvallis 88.7 FM, or listen live at kbvr.com/listen. Also, check us out on Apple Podcasts! 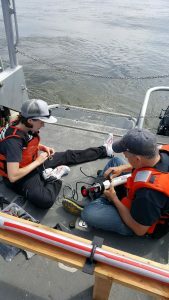 This entry was posted in Chemistry, College of Earth Oceanic and Atmospheric Sciences, graduate school, Marine Ecology, Ocean Ecology and Biogeochemistry, science communication, STEM Outreach, Uncategorized on 2018-06-10 by Lillian Padgitt-Cobb. Swimming away from the rocky shores out to sea Grace Klinges, a 2nd year PhD student in the Vega-Thurber Lab, is surrounded by short green sea grasses swaying in the waves, multi-colored brown sand and occasional dull grayish-brown corals dot the floor as she continues her research dive. However, the most interesting thing about this little island reef off the coast of Normanby Island, Papua New Guinea, is the forest of bubbles that envelopes Grace as she swims. Bubbles curiously squeak out everywhere along seafloor between sand grains and even eating their way through the corals themselves. It reminds one of how thick the fog can be in the Oregon hills, and like a passing cloud, the bubbles begin to dissipate the further away you swim from the shore, revealing an increasingly complex web of life wholly dependent on the corals that look more like color-shifting chameleons than their dull-colored cousins closer to the shore. 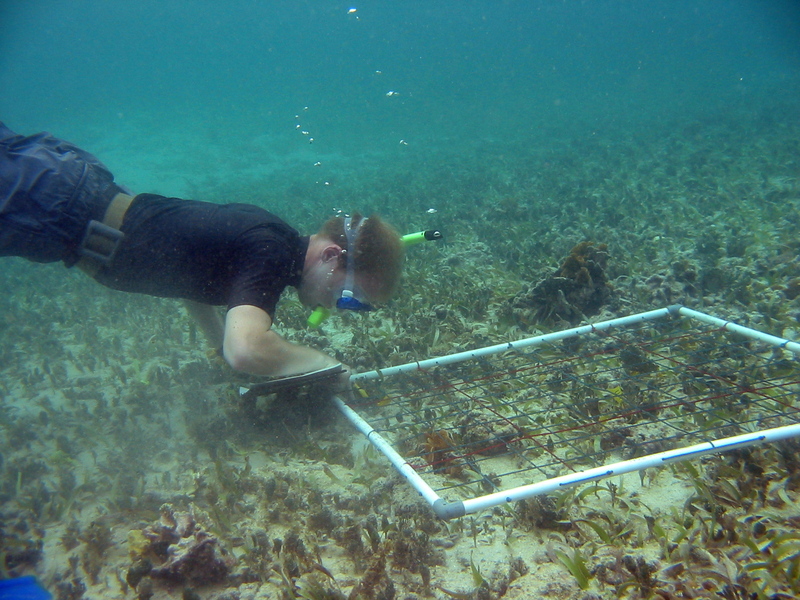 Grace took ~2,000 photos for each of 6 transects moving away from the carbon dioxide seeps. She is rendering these photos using a program called PhotoScan, which identifies areas of overlap between each photo to align them, and then generates a 3D model by calculating the depth of field of each image. These bubbles emanating from the seafloor is part of a naturally occurring CO2 seep found in rare parts of the world. While seemingly harmless as they dance up the water column, they are changing ocean chemistry by decreasing pH or making the water more acidic. The balance of life in our oceans is so delicate – the entire reef ecosystem is changing in such a way that provides a grim time machine into the future of Earth’s oceans if humans continue emitting greenhouse gasses at our current rate. 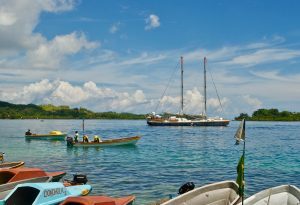 Corals are the foundation of these ocean ecosystems that fish and indigenous island communities rely on for survival. In order for corals to survive they depend on a partnership with symbiotic algae; through photosynthesis, the algae provide amino acids and sugars to the corals, and in return, the coral provides a sheltered environment for the algae and the precursor molecules of photosynthesis. Algae lend corals their magnificent colors, but algae are less like colorful chameleons and more like generous Goldilocks that need specific water temperatures and a narrow range of acidity to survive. Recall those bubbles of CO2 rising from the seafloor? As the bubbles of CO2 move upward they react with water and make it slightly more acidic, too acidic in fact for the algae to survive. In an unfortunate cascade of effects, a small 0.5 pH unit change out of a 14 unit scale of pH, algae cannot help corals survive, fish lose their essential coral habitat and move elsewhere leaving these indigenous island inhabitants blaming bubbles for empty nets. On the grander scale, it’s humans to blame for our continuous emissions rapidly increasing global ocean temperatures and lowering ocean pH. The only real question is when we’ll realize the same thing the local fishermen see now, how can we limit the damage to come? 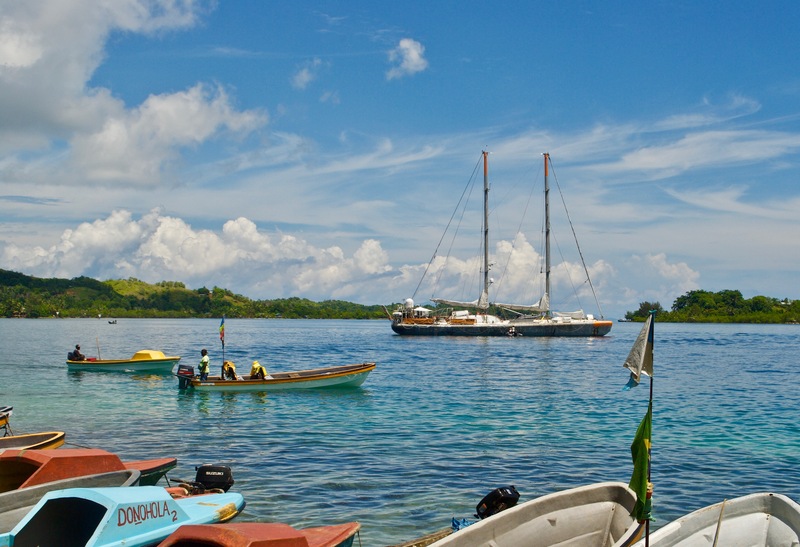 The lovely Tara Vessel anchored in Gizo, Solomon Islands. Grace Klinges is a 2nd year Ph.D. student in the Microbiology Department who is using these natural CO2 seeps as a proxy for what oceans could look like in the future, and she’s on the hunt for solutions. Her research area is highly publicized and is part of an international collaboration called Tara Expeditions as a representative of the Rebecca Vega Thurber Lab here at Oregon State, known for diving across the world seeking to better understand marine microbial ecology in this rapidly changing climate. Grace’s project is studying the areas directly affected by these water-acidifying CO2 seeps and the surrounding reefs that return to normal ocean pH levels and water temperatures. By focusing her observations in this localized area, about a 60-meter distance moving away from shore, Grace is able to see a gradient of reef health that directly correlates with changing water chemistry. 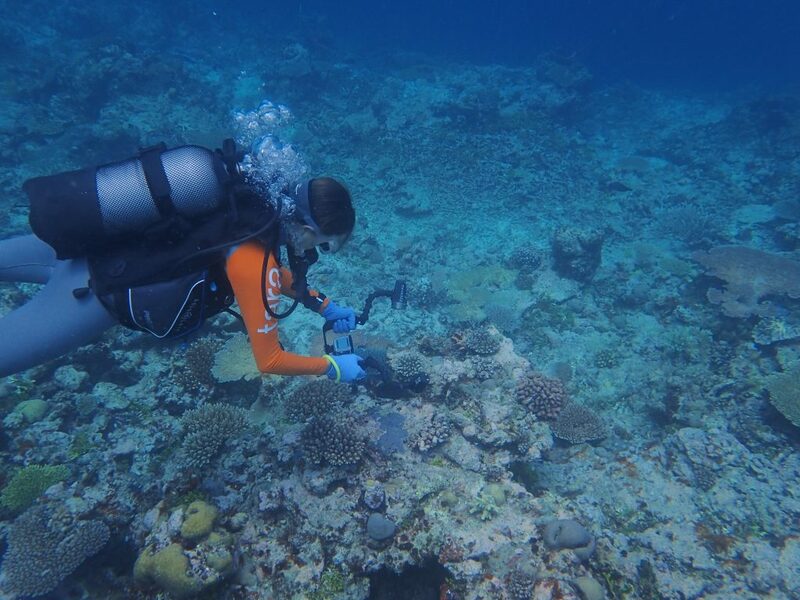 Through a variety of techniques (GoPro camera footage, temperature sensors, pH, and samples from coral and their native microbial communities) Grace hopes to produce a 3D model of the physical reef structures at this site to relate changing chemistry with changes in community complexity. One of the main ideas is that as you move further away from the CO2 seeps the number of coral species, or coral diversity, increases which often is expressed in a huge variety of physical structures and colors. As the coral diversity increases so should the diversity of their microbiomes. Using genetic and molecular biology techniques, Grace and the Vega Thurber lab will seek to better understand which corals are the most robust at lower pH levels. However, this story gets even more complicated, because it’s not just the coral and algae that depend on each other, but ocean viruses, bacterial players, and a whole host of other microorganisms that interact to keep this ecological niche functioning. This network of complicated interactions between a variety of organisms in reef systems requires balance for the system to function. Affectionately named the “coral holobiont“, similar to a human’s microbiome, we are still far from understanding the relative importance of each player which is why Grace and her labmates have written a series of bioanalytic computer scripts to efficiently analyze the massive amounts of genetic information that is becoming more available in the field. 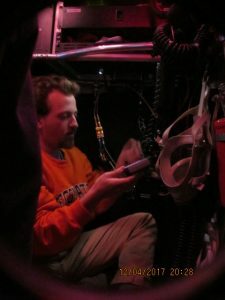 With the combination of Grace’s field work taking direct observations of our changing oceans, and her computer programming that will help researchers around the world classify organisms of unknown ecosystem function, our knowledge of the oceans will get a little less murky. Be sure to listen to the interview Sunday January 14th at 7PM. You can learn more about the Vega Thurber lab here. You can also download Grace’s iTunes Podcast Episode! This entry was posted in College of Earth Oceanic and Atmospheric Sciences and tagged acidification, algae, CO2, Coral, holobiont, ocean on 2018-01-14 by Adrian Gallo.